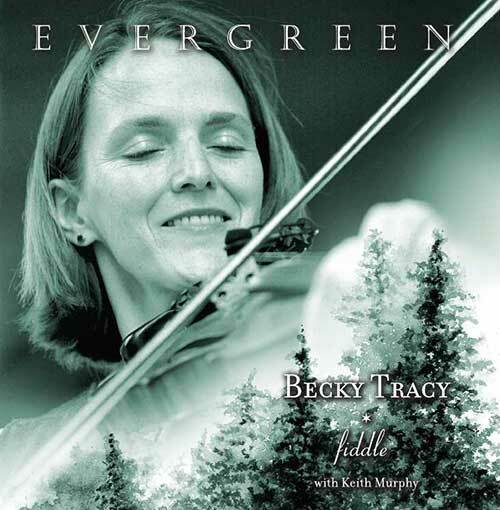 This is Becky’s debut solo recording from 2001, a fiddler whose bow has powered the music of Nightingale and Wild Asparagus. With guest musicians Keith Murphy (Nightingale, Popcorn Behavior), Jeremiah McLane (Nightingale, The Clayfoot Strutters), David Cantieni (Wild Asparagus, Swallowtail), Bill Tomczak (The Latter Day Lizards), and Benedict Koehler. Evergreen includes music from Ireland, France, Scandinavia and Quebec and several original compositions from Keith Murphy tastefully arranged, exquisitely played. This CD is a perfect showcase for an incredible fiddler whose sound is marked with a distinctive combination of power and beauty. Becky has brought together her closest musical companions for this project. Over the course of many years, Becky has developed a unique musical relationship with accordionist Jeremiah McLane through their work with the popular trio, Nightingale. On Evergreen, Jeremiah joins Becky on a set of Irish reels, a Swedish polska and a set of French Bourrees and fans of Nightingale will appreciate these pieces as a taste of that classic Nightingale sound. David Cantieni, Becky’s bandmate from the ever-popular dance band, Wild Asparagus, joins in with his flute and bombard on a set of Breton tunes. He also helps drive the opening set of Irish reels and harmonizes on the beautiful title track, Evergreen. Bill Tomczak and Becky are no strangers to each other having played many dances together over the years. But on this recording, Bill’s contribution goes beyond the bounds of New England dance music. A pair of mazurkas from Finland and France has Bill’s clarinet providing a haunting counterpoint and he adds a rich voice on the Evergreen waltz. Back in her early days in Vermont, Becky connected with the extraordinary Irish piper, Benedict Koelher. It was a special treat to be able to add his incredible musicality to two sets of Irish tunes. The entire recording is underlaid with the unerring sensitivity and creativity of husband, Keith Murphy. 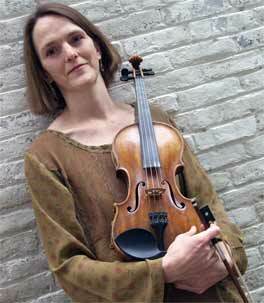 His playing on guitar, piano, mandolin, pump organ and foot percussion brings out the range and beauty of Becky’s playing through ever tasteful arrangements. He is the glue that binds her to the other amazing guest musicians she has brought together for this recording.